The Roman Emperor Gaius Aurelius Valerius Diocletanius (243-316 C.E.) built a palace here in what was then the Roman Province of Dalmatia, the city known as Spalato. Construction took place at the end of the 3rd century C.E. (about 293), and into the beginning of the 4th century. From what had been a rather small and relatively insignificant port city, Split blossomed and grew into a city of 200,000. Previously part of Yugoslavia, it is now in Croatia. Diocletian retired here in 305 C.E. after abdicating his position as ruler of the Eastern half of the Roman Empire. The times produced multiple emperors. The Palace was a combination of a fortified camp and residence (overlooking the Adriatic). The design is an irregular rectangle, almost square, measuring 180 by 215 meters (585 by 700 feet). There are two main streets intersecting the complex, forming the heart of the old city. The southern half contained the Emperor's apartments, including his mausoleum, and the northern half, not well preserved, apparently held soldiers' barracks, servants' quarters, and other service facilities. The Palace was built of white limestone, quarried locally. 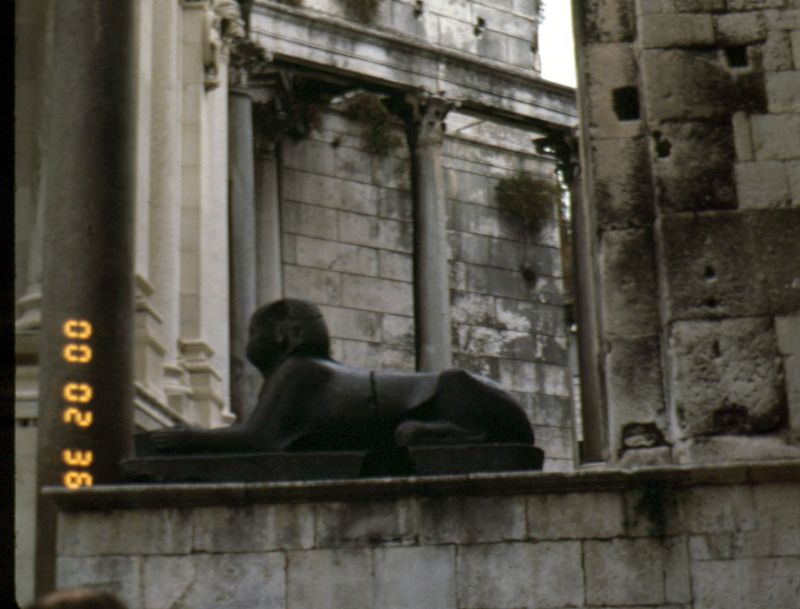 Decorative materials were imported - the columns and sphinxes are of Egyptian granite. It seems there is more left here of a Roman Palace than anywhere in what is now Italy. 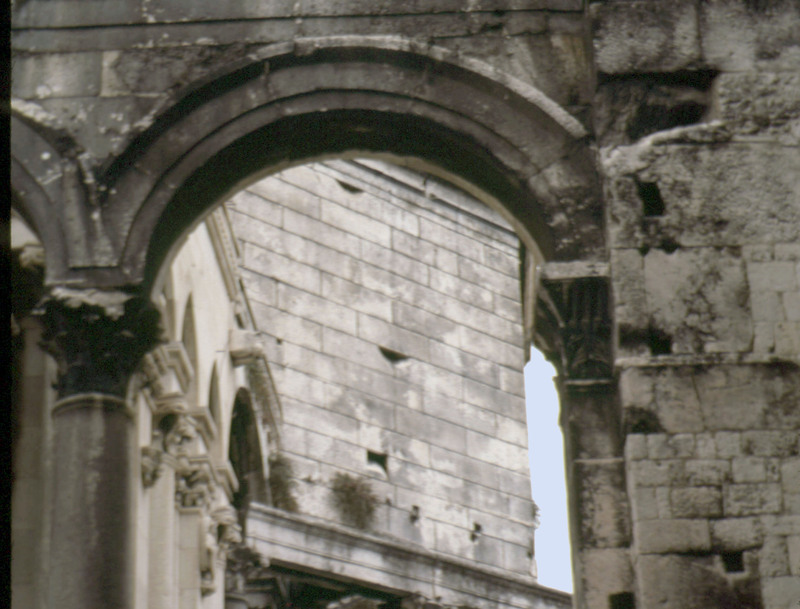 This may be what remains of an open arcade connecting at angles to Diocletian's Mausoleum in the background. The upper part of the arcade viewed in the image above. The reduplicated archway, replete with a shadow effect achieved by indentations as well as protrusions, helps carry the eye along the graceful repetition of the arches. Many details in this complex began to change from strictly Roman to what was to be the Romanesque; it deserves special study for that reason. Such information could be the subject of a term paper.